When we first moved to Pittsburgh, I suffered from a mini meltdown in the wardrobe department. I’m pretty sure that as a personal stylist I’m not supposed to admit this, but honestly, one of the reasons I think I can relate so well to my clients is because I’ve experienced many of the same issues that they’ve faced with their style and their closet. I know where my wardrobe malfunction sprung from – I unpacked my clothes from the UK and India (some of which I hadn’t seen for 3 years), and realized that a few of the items that were looking a little worse for wear and would need replacing, but I struggled to do so without the familiarity of the brands I’m used to in the UK. I knew EXACTLY where to shop to get what I needed at home, but I wasn’t at home, I was in a totally country. Pittsburgh has a very limited selection of British and European brands so I found myself searching for US stores that were similar, and while a few shops felt familiar I found it quite limiting, and I found that very frustrating. I knew I would have to update my retail knowledge and learn about US brands and sizes if I was to successfully style US clients, but it hadn’t occurred to me that I would have to do the same for myself. I had to change my mindset – Instead of trying to find clothes I can find at home, here,. I changed tack and embraced the different styles that are available to me in the US, adapting them to suit me. After a few months, I saw moving to the US as an opportunity to develop my style. I’ve been in Pittsburgh for a 18 months now and have been working with American clients, so I have a much better understanding of US brands, so I thought it might be useful to share some of the things that helped me to adjust to shopping and styling myself in a different country. Check out the local bloggers, they’re a great way to discover local designers and boutiques that sell something different from the big brands. I found this invaluable when we lived in India as not many of independents had websites. Head to the local flea and neighborhood markets. They’re really popular in the US and I’ve found them a great way to learn about each neighborhood and to uncover the best boutiques the city has to offer. Once you’ve discovered shops you like, keep a record of them. Especially if you find an online retailer you like as it’s easy to lose track of them. I clip webpages to Evernote, it’s a brilliant tool that I use to keep track of everything from lists, to recipes. It can take a while to get used to the different sizes in a new country so keep a size guide in your wallet. 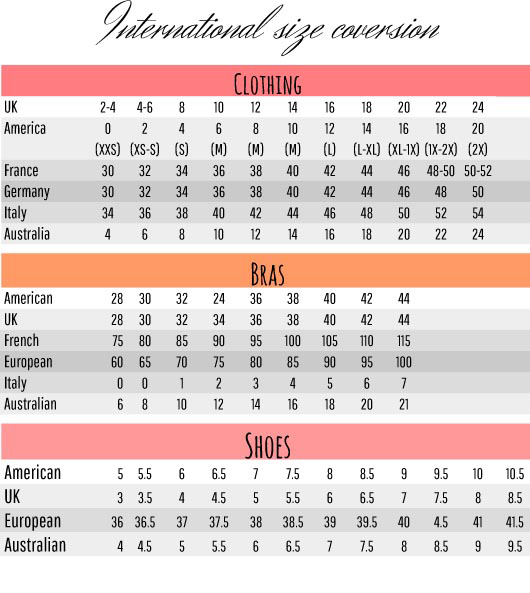 I’ve compiled a wallet sized, international size guide (see below) that you can download here if you like. (If you do print it off, make sure to choose double sided printing). If you have the time and can be bothered, try on a selection of different brands to get a feel for their fit (a department store is the best place to do this). Not only is it impossible to know how a brand will fit you until you’ve tried it on, but sizes vary from brand to brand too. I had to try on a ton of different brands so to help me understand which brands would suit my clients, and it helped me work out which ones fit me best too. Speak to the locals! My #stylishpittsburgh campaign has been a brilliant way to meet people and learn more about the city and it’s fashion scene. I know this is probably an obvious one, but ask your friends, especially the ones who are a similar shape to you! I don’t’ advocate buying things without trying them on first, but if you have to then make sure you check the returns policy before you part with your cash. We have a pretty good deal in the UK when it comes to returning goods, particularly when you’re returning goods bought online, don’t assume that the same everywhere else. Have you found yourself struggling to shop and style after a move abroad? I’d love to hear how you dealt with it and what advice you have!